These Topiary Place Holders* look so bright and green and make a white place card really pop (sets of 4 start at $10.40). 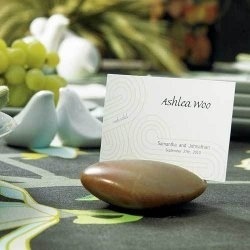 I also loved these sleek Natural Stone Place Cards* (sets of 8 start at $14) for a down-to-earth but still elegant look, and for a beachy theme, these Shells By The Sea holders look polished and pretty. I adore these fortune cookie holders ($22.99/ dozen, above) and think they would work for weddings, graduations, anniversaries, a shower, any occasion tied to anticipation of the future and a momentous life event and this holder with simply the word LOVE stacked in two rows ($1.70 each, pictured) was artsy, cool and nice looking on a party table but something I could see a guest using later. 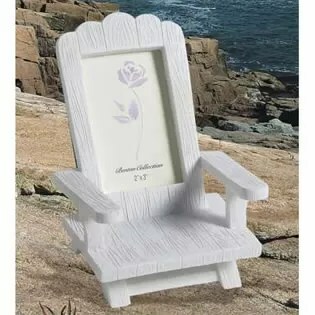 Frames have been done before and work great doing double duty as holder/favors but to put a unique spin on them, this Adirondack Chair version (starting at $2.79 each, pictured) is a fun update to standard version. 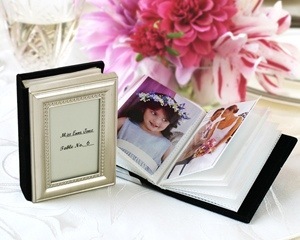 This Little Book of Memories Place Card Holder and Mini Photo Album Favor (starting at $3.59, pictured) looks amazing and depending on the event, you could even pre-fill it with one picture of the happy couple or the expectant family or the proud graduate as a way to start the album. For simple and pretty, these Beaded Photo Frame Placeholders (starting at $2.14 each)are a great utilitarian accent to almost any table. Candles – I know, I know… My first thought was candles near place cards (paper) was concern. But these and these Chalkboard Candles (pictured) from Diva Entertains are adorable and work for all kinds of events ($29.99 set of 4). I’m now a fan. 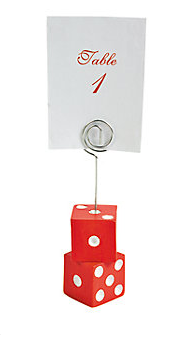 Luggage Tags – Another pretty but utilitarian place card idea that guest will surely use again and again. 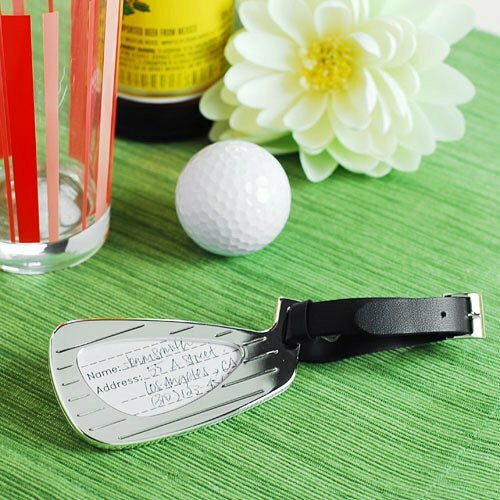 This simple one* (starts at $8.50) will go with almost any decor, but there are tons of themes out there from golf* ($7, pictured) to martini glasses (starts at $2.08 each) to stilettos ($3.15 each) and hearts($4.45 each). 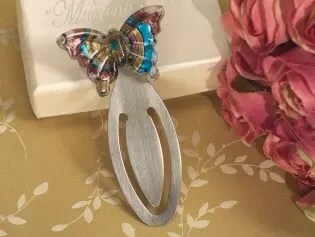 Bookmarks & Whimsy – The trick with a bookmark is you need to find one that can hold a place card, not just any pretty one will do. This Glistening Starfish Bookmark ($1.29 each), this Art Deco Butterfly ($1.20 each, pictured) and this Double Heart Shaped Chrome Bookmark ($0.92 each) all would work. Make sure you lay the bookmark on any box that it comes with, maybe even tie it with ribbon, so your guests know it is theirs to take with them. Another fun idea for a shower is a Design Her Gal bookmarks** and place cards** that add some personality to your table and event. Shop and Save: I’m a big fan of Oriental Trading. I got those snowflakes for Christmas Eve, I got there very inexpensively ($14.99 for 12 and now they are on sale for $6.99), and it was delivered in 3 days. 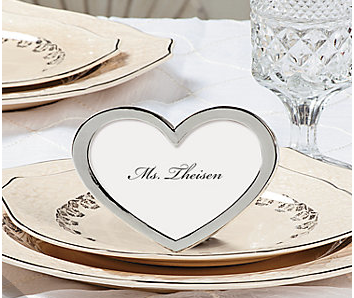 Just browsing now, I found these silver toned frames ($7.25 for 12), these heart shaped name card frames ($8.50 for 12) – pictured – and these die-cut photo frames ($4.25 for 24). If frames aren’t your speed, they have holders with a variety of themes including hearts, dice – pictured -, cowboys, bells, stars, shells, butterflies, and more (sold by the dozen starting at $4). Another great idea for place holders is actually an easy DIY that I saw at this one wedding I went to. You take cork screws from wine and then just place a little pin in it and then attach a number to the pin, it was really super cute! I love the variety you have and all of the pictures of the different place card holders, very neat ideas for different events. Thanks so much! I love that corkscrew idea too. So inventive and fun. I may have to try that. You can use the email sign up, RSS, or follow Gifting Whisperer on twitter http://twitter.com/Gift_Whisperer (@Gift_Whisperer) — I always post new blog posts there. Thanks for reading.